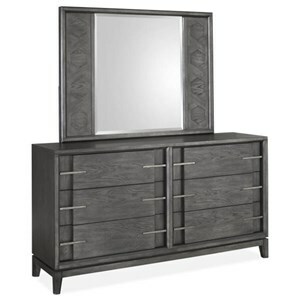 Bring an on trend look to your bedroom with this contemporary dresser and mirror set. You'll love the pairings textured, faux shagreen finish, as well as its gold finished metal hardware and accents. Plus, with the dresser's felt-lined top drawers and cedar-lined bottom drawers, this set's storage space is sure to cater to your exact needs. 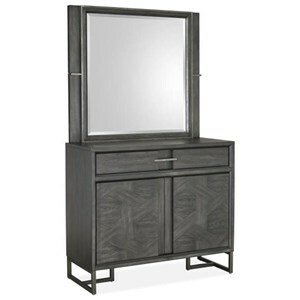 The Carmen Contemporary Dresser and Mirror Set with Metal Accents by Pulaski Furniture at Reeds Furniture in the Los Angeles, Thousand Oaks, Simi Valley, Agoura Hills, Woodland Hills, California area. Product availability may vary. Contact us for the most current availability on this product. Bring your decor the distinctly modern look you're looking for with this contemporary bedroom collection. These pieces feature faux shagreen finishes that give them a textured appearance, as well as gold finished metal accents that perfectly complete their designs. Plus, the storage pieces are built with dovetail construction, metal glides, and dust bottoms, so they're just as functional as they are good looking. The Carmen collection is a great option if you are looking for Contemporary furniture in the Los Angeles, Thousand Oaks, Simi Valley, Agoura Hills, Woodland Hills, California area. Browse other items in the Carmen collection from Reeds Furniture in the Los Angeles, Thousand Oaks, Simi Valley, Agoura Hills, Woodland Hills, California area.